Alex Lloyd Gross- Photo- Delaware Valley News.com Philadelphia District Attorney Lawrence Krasner. Controversial Philadelphia District Attorney Lawrence Krasner has come under intense fire, after he ignored the family of slain Police Sergeant Robert Wilson’s family. 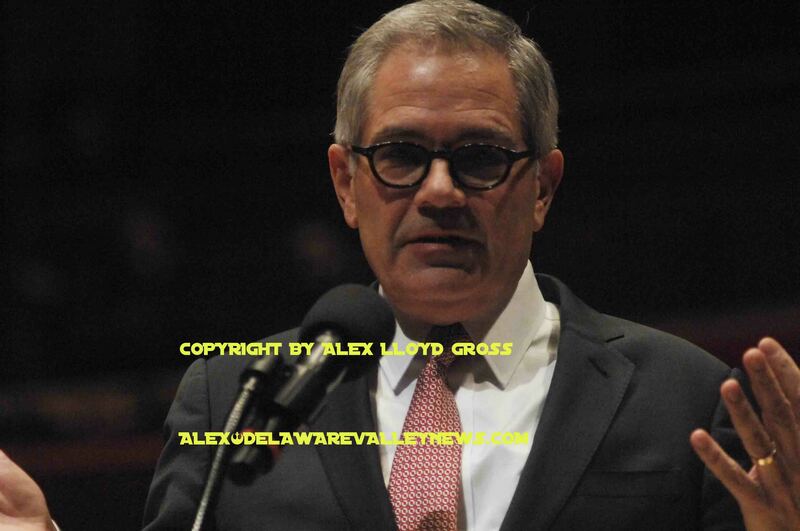 They wanted the two males responsible for the murder of their loved one to be eligible for the death penalty.. Krasner visited the family months ago where he informed them that that his office would entertain a deal to keep the death penalty off the table. They were upset then, and they are livid today. Today is June 25, 2018. It is also the date that Carlton Hipps and Ramone Williams plead guilty to Wilson’s murder in exchange for a life sentence behind bars , plus 50 to 100 years each. They will never get out of prison. In March of 2015, then Officer Wilson stopped his marked patrol car outside a Game Stop in North Philadelphia, to buy his son a present for his birthday. Hipps and Williams ignored the parked cruiser, went into the store and tried to rob it. Wilson drew them away from people, got into a gunfight and was killed. Krasner’s Office, according to Wilson’s family , was supposed to keep in touch with the family and advise them of what was going to happen. His job was to work towards the goal of the family. Not circumvent their wishes to suit his own political belief’s which is against the death penalty. During a press conference outside the courthouse, many relatives said they were not notified about any plea deal until Friday. Too add insult to injury, they were told the deal had been reached, not consulted about how they would feel if a plea deal was reached. Krasner left the hearing before it had concluded. During that conference, family members of the slainofficer’s family called Krasner “a Joke” and “A disappointment”. Krasner held his own press event where he said that the two son’s of Wilson has been threatened by the FOP. That claim was dismissed by the FOP . Krasner said that by taking the case to trial would have forced the family members of Sgt. Robert Wilson to relive the shooting. Krasner said that since a moratorium on the death penalty was imposed in 2015, his deal has the same outcome. The killers will die in prison. Officer Robert Wilson was promoted to the rank of Sgt. posthumously.